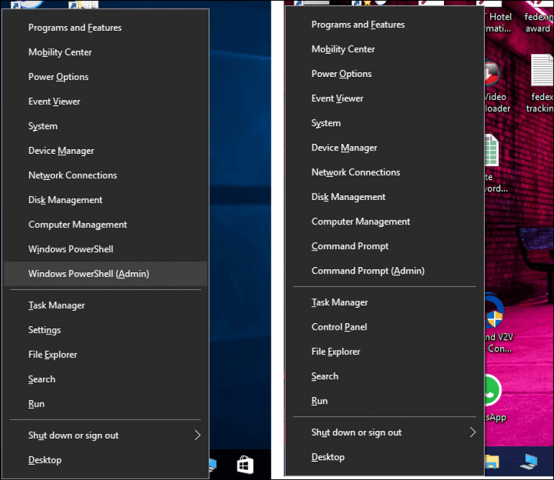 If you’re recently upgraded to Windows 10 Creators Update and you’ve used the Command Prompt shortcuts when you right-click on the Start Menu, you might be surprised to see that Command Prompt has been replaced by Windows PowerShell (resembling the left screenshot above). While Powershell has its place, I tend to use Command Prompt more often than Powershell, at least on my workstation. Luckily there’s an easy way to get our beloved Command Prompt back. Then turn off “Replace Command Prompt with Windows PowerShell in the menu when I right-click the start button or press Windows key+X”. Now when you right-click on your Start Menu, you’ll see your Command Prompt and Command Prompt (Admin) back. It would be nice to enable both for the real power users, but maybe that will come in a future update.